World Animal Protection (WPA) – an international non-profit animal welfare organisation – has urged the environment ministry to ban the ‘cruel’ practice of elephant rides in India, adding that a loophole in the animal protection law is being used to carry on the practice of illegal trade of animals. 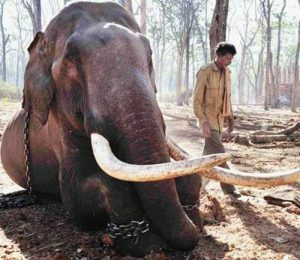 The letter, addressed to Dr Harsh Vardhan, said that the elephants undergo extremely harsh treatment at the hands of the handler and suffer their entire life in captivity for the sake of people’s entertainment. The letter also noted that even seven years after being declared the National Heritage Animal, the condition of elephants continues to be miserable. The organisation also demanded the withdrawal of the exemption given to live elephants in Section 40 of The Wildlife (Protection) Act, 1972, which the body alleged was used to drive illegal smuggling of tuskers. The Wildlife Protection Act prohibits commercial trade of live elephants and ivory. However, there’s an exemption under section 40 of the Act, where elephants can be gifted or donated, provided the donor has proven his capability of taking care of the animal. The provision in the Act is misused by those who use it as a cover for trade in the species. Recently, WPA’s study has found widespread abuse of elephants under captivity across Asia. The report, titled, “Taken for a Ride”, said elephants are beaten to the point that they are seriously wounded from the daily chores and also show severe stereotypical behaviour because of the incessant abuse. 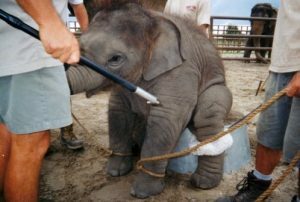 All wild-caught and captive-bred elephants undergo training, which is nothing short of inhumane, in its early years, if they are to be used for activities. Typically, the calf is separated from its mother at an early age. In the case of a wild elephant, anecdotal reports indicate that the protective families of the calf may be killed in the process. It will then be restrained by chains or ropes and prevented from moving unless commanded by the trainer or mahout. 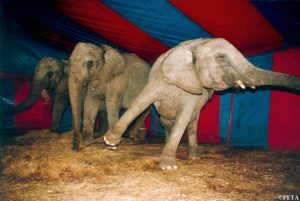 More often than not an elephant will be kept in abysmal conditions. They are not even provided with the space to sit down and kept in dingy spaces. They are also kept on poor diets, given limited veterinary care and are frequently kept on concrete floors in stressful locations near loud music, roads or visitor groups. Nearly 74 per cent of captive elephants in Asia that were examined, exhibited symptoms of Post-traumatic Stress Disorder (PTSD), which includes symptoms like stereotypic behaviours, self-mutilation, severe anxiety, infanticide and inter and intra-species violence. India is widely considered to be the place where the practice of taming elephants had first started. 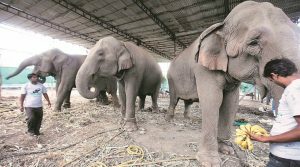 Be it Jaipur’s Amer Fort or the beaches in Kerala or even the animal trade fair in Bihar’s Sonpur, captive elephants have always been in great demand for tourism activities. India’s captive elephant’s population is estimated to be between 3,000-4,000 while it is home to over 60 per cent of world’s wild elephant population. Indian forests shelter nearly 30,711 wild elephants, according to the 2012 census report by the Ministry of Environment and Forest of India.